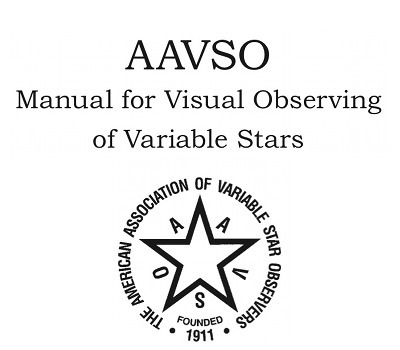 The AAVSO Manual for Visual Observing of Variable Stars (ISBN 978-1-878174-00-0) is a comprehensive guide to variable star observing. Included is a lot of information and tips on how to make variable star observations and report them to the AAVSO. The Manual is available online in .pdf format. Translations of the Manual are available in several languages. Chinese - "Simplified Chinese" version translated by Cheng Simiao, January 2012. "Traditional Chinese" version translated by Tao Fan-Lin December 2012. French - translated by Dominique Naillon, May 2013. German - translated by Ilka Petermann, December 2016. Greek - translated by Stelios Kleidis, October 2015. Hungarian - translated by Péter Molnár and Dr. Laszlo Kiss, June 2013. Italian - translated by Dr. Giuseppe Bianco, December 2008. Japanese - translated by Seiji Tsuji, May 2009. Persian - translated by F. Bahrani and colleagues, June 2014. Polish - translated by Ariel Majcher, Bogdan Kubiak, Marcin Biskupski, Michał Kwieciak, and Piotr Guzik, May 2016. Portuguese - translated by David Duarte Cavalcante Pinto and members of CEAAL, April 2011. Russian - translated by Dr. Nikolai Samus, June 2017. Spanish - translated by Jaime Garcia, December 2013. Turkish - translated by Tuğrul Uşşaklı, Sabahattin Bilsel, and Haldun Menali, December 2006.